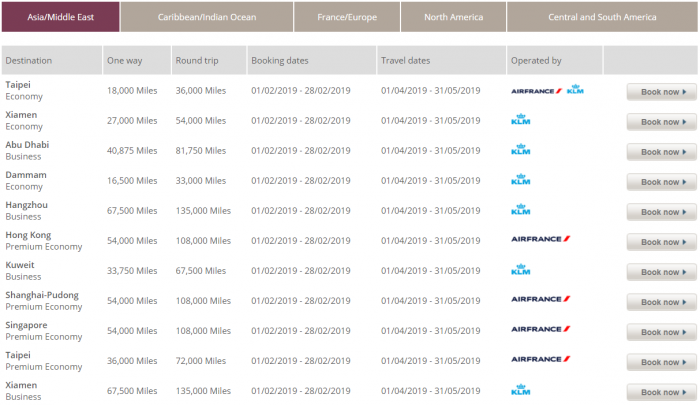 Air France-KLM Flying Blue has just released their February promotional awards for April 1 – May 31, 2019-travel. The discount is usually from 20% to 50% off the usual number of miles required (although sometimes the discount is capped at 25%). You can also book these as one-way. These are not only for originating from Europe as all the destinations are valid for both directions. Flying Blue used to divide Europe to zones 1, 2 and 3, but seems to just use the designation EUROPE for all these from now on. Albania, Algeria, Belarus, Bosnia Herzegovina, Bulgaria, Cyprus, Canary Islands, Croatia, Croatia, Czech Republic, Estonia, Greece, Hungary, Israel, Libya, Lithuania, Latvia, Macedonia, Moldova, Morocco, Poland, Romania, West Russia, Serbia, Slovakia, Slovenia, Turkey, Tunisia, Ukraine. Flying Blue has changed the taxes and mainly fuel surcharges that it collects for award tickets making economy awards a better deal than they used to be. The fuel surcharge that Air France-KLM now called “carrier imposed international surcharge” is capped for premium economy, business, and first class flights as well. The Promo Awards are quite good this time, and both economy and business to/from Montreal are priced very reasonably.